The Memorial Day weekend in the United States is the unofficial start of summer. It’s also the weekend that grills across the nation — having lain dormant under feet of winter snow — get dusted off, cleaned out and fired up. If you’re on the hunt for an easy grilling recipe that is both adult and kid-friendly, raises the bar over traditional hamburger and hot dog fare, and takes no more than five minutes to cook once it hits the flame, this is the recipe for you. Acids: break apart the meat and collagen fibers on the meat surface which allows it to better retain moisture. But if you use too much acid in a marinade, or marinate the meat for too long in an acidic marinade, the meat will become mushy as the meat fibers break even further apart. Oil: carries oil-soluable flavors and coats the surface meat fibers in the flavoring agent (in this case, lemon and garlic). Salt/high-sodium ingredients: add flavor, but also work as a brining agent to pull moisture from the marinade into the meat. Flavoring agents like garlic and herbs: once the acids and salts have worked their magic on the meat and collagen fibers, these flavors combine with the oil to penetrate the outermost surface of the meat and add complex and complementary tastes. This particular recipe uses highly-acidic lemon juice in combination with salt to quickly tenderize and brine the outer surface of some thinly-cut chicken breasts. The olive oil and garlic, in combination with the citrus flavor of the lemon juice, then works its way into the chicken. These chicken breasts are very tender and flavorful as a result, the perfect complement to a Memorial Day spread. 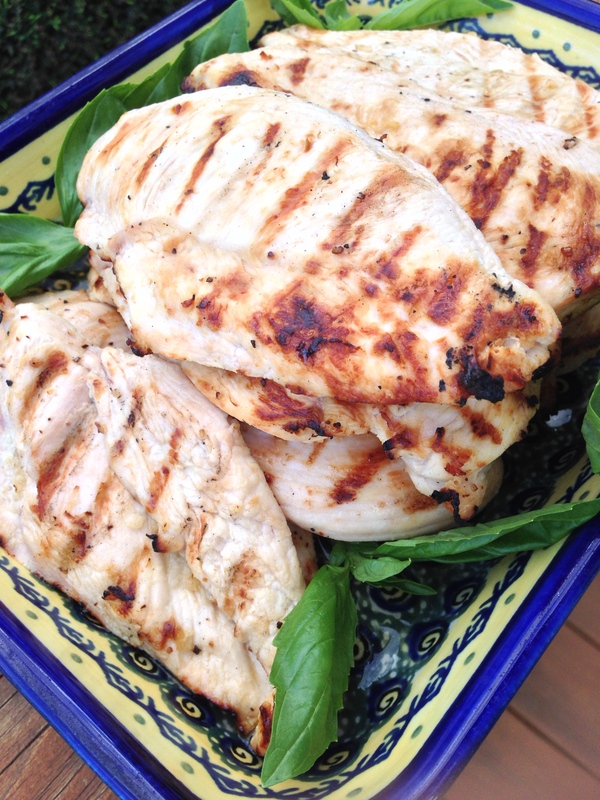 Keep reading for our easy Grilled Lemon Garlic Chicken Breast recipe! Sagittarius vs. Gemini. Maybe this explains the fundamentally different food preferences our two daughters have adopted. Both of them, with strong encouragement, will try just about anything. 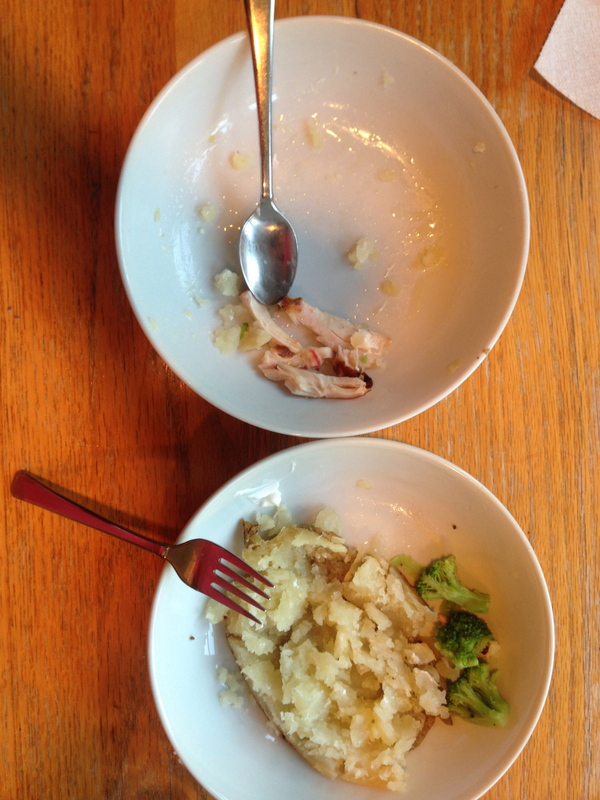 But when mealtime is over more often than not their plates look very different. One eats every bite of protein first. The other digs right in to the starch…pasta, rice, potato. Unless there is broccoli on the plate, and then that gets eaten first. What this means is that by the time they stop eating, the things that are left between the two of them could actually make up their own well-balanced — though skimpy — meal. Our most recent dinner was a case in point but I still stand by the menu — grilled chicken, baked potatoes and broccoli — as one that is both kid-friendly and balanced, with lots of different tastes to try. Our twist was hickory-grilling the chicken which is so simple that it’s less of a recipe and more of a tutorial on working the grill. 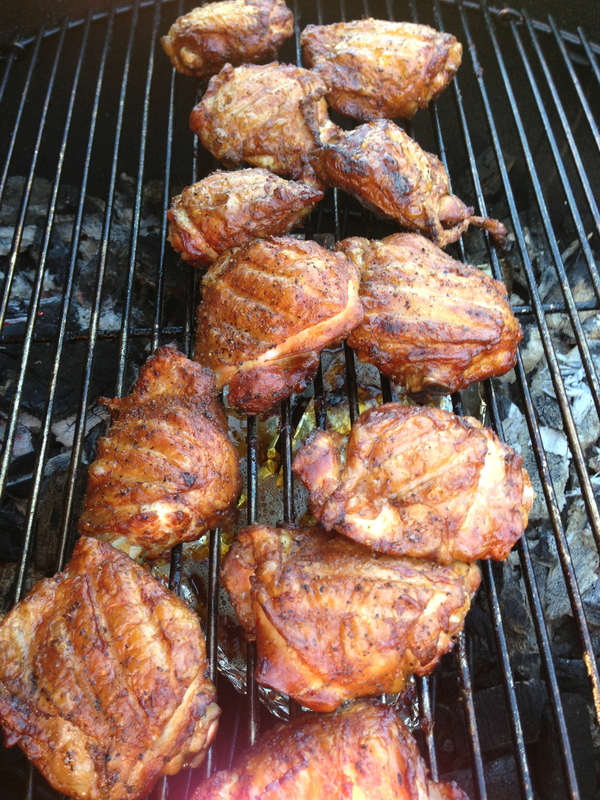 I cooked the chicken on our Weber grill over an indirect hardwood charcoal fire. I recommend the explanation of indirect vs. direct grilling on Steven Raichlen’s Barbecue University website if you’re not familiar with the difference. If you have a gas grill you’ll want to adjust accordingly but we really like the flavor of hardwood charcoal. You will also need hickory wood chips, in addition to your regular charcoal if you have a charcoal grill. Soak the chips in water (or liquid of your choice…beer or apple juice work well) for about an hour before grilling. Prepare the coals for indirect grilling and, once hot, clean and oil the grate (very important unless you want your chicken to stick). I put a tinfoil drip tray — just a sheet of tinfoil, doubled over and crimped around the edges to form a small tray — under the grate on the portion of the grill kettle without coals. This tray catches dripping fat as the chicken cooks and also helps insulate the chicken a little from the direct heat of the coals. Put the chicken on the grill over the drip tray, skin side down, throw a handful of wet hickory chips onto the coals and close the lid. Cook thighs for 30 minutes before flipping and cooking for another 30, lid closed. 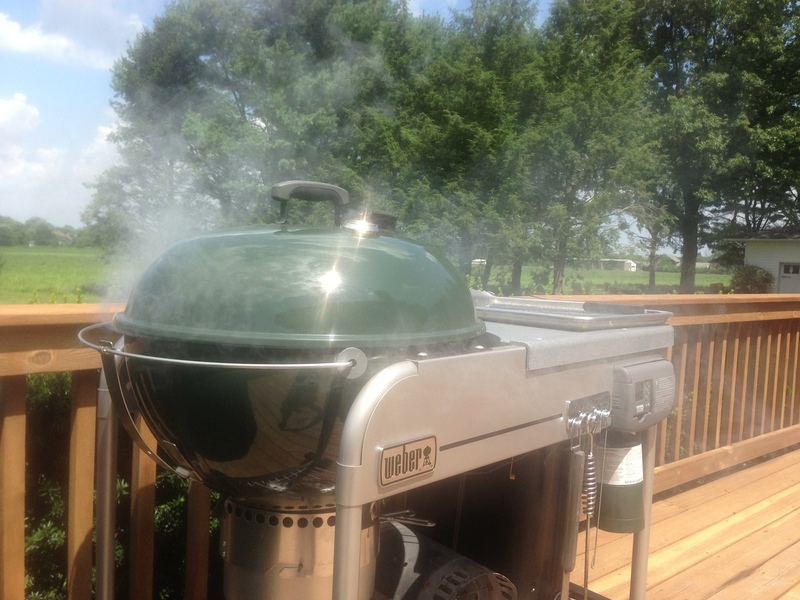 The grill should register approximately 375-400 degrees and you’ll want to maintain that heat for the hour of cooking. Much higher than that and you’ll have dry chicken. Much lower than that and the chicken won’t cook. Yuck. The drumsticks take a little less time. Start them about 20 minutes after the thighs and flip them once after about 20 minutes so that they grill for a total of 40 minutes. Put a handful of wet hickory chips on the coals every 20 minutes or so and position the grill lid vent on the opposite side from the coals and wood chips so that smoke is drawn up through the grill. The chicken is done when the internal temperature reaches 165 degrees. Rest the chicken for 10 minutes before serving. Regardless of what you serve with these, hopefully every plate leaves your table empty. Parent rating: four-and-a-half stars. I smelled like a BBQ pit but the smoking gives such great flavor that it’s worth it. A good investment of an hour on the back deck. Leftovers can — and will — be shredded and mixed with barbecue sauce and served on rolls the next day. Kid rating: four-and-a-half stars/two stars. This is what I mean by “A Tale of Two Children” — one daughter ate every bite, though the slightly darkened skin made her look twice. The other ate a fair portion but stayed away from the more flavorful bits, and the more “done” bits. And any bits that tasted too much like…chicken. Ah, maybe next time.